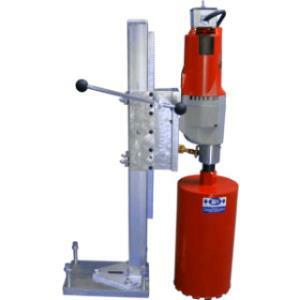 Our core drilling rig comes mounted on a stand and will accommodate core bits up to 8" in diameter. Machine can be mounted to the floor or against a wall using the four included mounting screws on the base. This tool must be used with provided water attachment which hooks to a standard garden hose. Bits rent separately from the machine, and prices vary according to size. CORE DRILL BIT - 2"
CORE DRILL BIT - 3"
CORE DRILL BIT - 4"
CORE DRILL BIT - 1"
CORE DRILL BIT - 8"
CORE DRILL BIT - 5"
* Please call us for any questions on our core drilling rig rentals in Hillsdale and Ridgewood NJ.